More than 60,000 people—food professionals and consumers alike—attended this year’s Natural Products Expo West in Anaheim, California, the largest health food trade show in the world. The pulse of the industry reverberated through the nearly 600 exhibitors in the natural and specialty food segment. The impressive number of new products brought fresh innovation and entrepreneurial spirit into focus. While several trends were pronounced throughout the expo, including non-GMO, raw, vegan, and probiotics, the allergen-free product category took center stage. As many as 15 million people in the United States have food allergies, according to the Food Allergy & Anaphylaxis Network, of which an estimated 9 million are adults and nearly 6 million are children, with young children affected most. The June 2011 issue of Pediatrics reported that one in 13 children in the United States have food allergies, a number that continues to grow. As RDs are well aware, that number doesn’t even include people with gluten sensitivities and intolerances and those allergic to dairy. The media focus continues to be on gluten-free foods and for good reason. Gluten-free foods have shown the most market influence, with 2011 sales reaching $6.2 billion, a 16.9% increase from 2010, according to the Illinois-based market research firm SPINS. Yet a walk down any aisle of exhibits made it clear that gluten free is just one aspect of what has come to be known as the “free-from” category. Foods are still gluten free, but they’re also allergen free, which might include soy, dairy, and nut free. The most popular products have clearly identifiable free-from labels, taste great (rather than merely palatable as in years past), and have added attributes such as raw, vegan, or low-fat formulations. No group within this category (eg, baby food, beverages, pasta) was left out, but the snack food category clearly excelled when it came to variety. This is refreshing news for dietitians who see clients every day with food allergy and sensitivity issues looking for ways to eat well while avoiding reactions to common food allergens such as milk, eggs, and peanuts. In the past, it’s been as much of a challenge for the RD to recommend healthful substitutes for these traditionally favorite foods as it’s been for clients to refrain from eating them. This is especially true of snacking, which makes people vulnerable to poor choices. The following are the top allergen-free snack categories that stand to be the most popular with consumers who have food allergies. The innovation in this category captured much attention. Traditional corn chips and the more recent vegetable chips were on display, but the showstoppers were those that really stepped outside the box. Experimentation with different grains, seeds, and even legumes to create something gluten free was a clear expo trend. Crunchmaster’s Multi-Seed Rosemary & Olive Oil Crackers are made with quinoa, amaranth, and flaxseed. They’re oven baked, healthful and, yes, gluten free. Brown rice is the base of Lundberg’s Organic Rice Chips, which are gluten free and vegan, and Mediterranean Snack Food Company offers Rosemary Herb Lentil Crackers. Fruits and vegetables also were well represented in this category—and we’re not talking potato chips. Kale chips were popular, displayed by several exhibitors. In flavors such as Mango Habañero or Bombay Curry, made by Rhythm Superfoods, raw, vegan, and gluten free doesn’t get any tastier. Natural Garden’s Healthy Seaweed Snacks add dairy free to its label along with no sugar, MSG, or preservatives. Completely allergen free, Turbana Plantain Chips are slim on ingredients—just plantains, vegetable oil, and spices—and Havit Raw’s Savory Cranberry Crackers are free of gluten, dairy, soy, and nuts. Allergen free is especially pertinent to families with young children who are more affected by food allergies than any other age group. Whether it’s the outlawed peanut butter and jelly sandwich in a school lunch or the off-limits cookies or cake at a party, children with food allergies are excluded from beloved food traditions. Enter concerned parents fueled by a desire to find a solution and with a bit of an entrepreneurial spirit. Jill Robbins, founder of HomeFree Treats, is one of those parents. A mother of a child with food allergies, she started the company so everyone could be included when snacks and desserts are offered. The HomeFree cookie booth at the expo was as full of samples of her Vanilla Mini Cookies and Crunchy Chocolate Chip Cookies as with displays of enlarged free-from labels that describe her products. HomeFree Treats are as allergen free as it gets—free from the eight most common food allergens and certified gluten free—as well as certified kosher, vegan, and a source of whole grain, to name but a few attributes. A taste of the samples confirmed what the many awards her cookies have been presented proclaim—yum! Overall, the allergen-free cookie samplings were—surprise—very tasty. Nana’s Cookie Bites were no exception. Clearly labeled as containing no wheat, gluten, refined sugar, eggs, casein, and more, these soft-baked cookies are available in many flavors, from Oatmeal Raisin to Ginger and Fudge. Wheat, gluten, and dairy free, Pamela’s Products Traditional Cookies take the cake, so to speak, on variety. Choices such as Espresso Chocolate Chunk and Peanut Butter cookies make it clear that the free-from category doesn’t sacrifice indulgence. Also notable were Kinnikinnick Foods’ graham-style crackers and chocolate sandwich and animal cookies, and 1-2-3 Gluten Free’s completely allergen-free cookie and brownie mixes. In our fast-paced society, it’s no surprise that bars of all types have become the go-to snack or meal. Probably the most represented category of health foods at this year’s expo, breakfast, granola, energy, protein, and nutrition bars, among others, displayed several free-from labels. Rise Bar markets itself as a breakfast, energy, and protein bar. The breakfast bar, made with honey-sweetened chunks of fruit and nuts, is free of gluten, GMOs, dairy, peanuts, and preservatives and is 100% natural and vegetarian. Bakery On Main offers three different bar types: Soft & Chewy Granola Bars in kid-friendly varieties such as Peanut Butter & Jelly; Granola Snack Bars, which are studded with fruit and nuts; and its newest Truebar, a fruit and nut bar. Not only are Bakery On Main products gluten free and have an extended free-from list, but many also contain ingredients such as quinoa and amaranth, gluten-free oats, and omega-3-rich chia and flax. Raw foods had a more prominent showing at this year’s expo in the form of bars. Inspired by a multiple sclerosis diagnosis in 2004, the founder of Two Moms in the Raw, Shari Leidich, found a natural route to healing through food. Unable to find a satisfying snack on the go, she came up with Nut Bars and a small assortment of other snack foods using raw, natural, organic, and gluten-free ingredients. The three varieties—Blueberry, Cranberry, and Gojiberry—are handmade. LÄRABAR showcased its 20 varieties of bars, all raw and made from between two and nine ingredients. Most LÄRABARS are allergen free; certain varieties contain soy and peanuts. However, all are gluten and dairy free. This brand has gone mainstream and is available in grocery and specialty food stores. 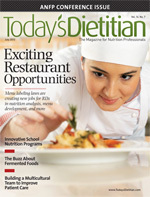 Each year, the healthful food trends change to meet the evolving needs and demands of consumers. The growth of the allergen-free and free-from categories indicates the increased awareness of food allergies and sensitivities. The innovation in the variety of ingredients and flavors and the addition of healthful attributes in this category mean more choices for people who have special dietary needs and for the dietitians who recommend them.